Lucy Hale is popularly known for her role of Aria Montgomery from Pretty Little Liars. Apart from acting what she is known for is her tattoos. Let us know further about her inks. 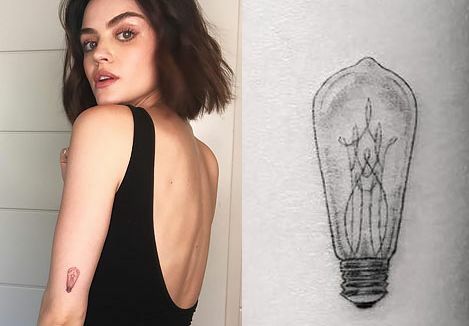 Lucy Hale has “light” inked in cursives on her left side. She got this inked by Dr Woo at the Shamrock Club in Los Angeles in 2012. This tattoo is special to her as her name Lucy is derived from the Latin word Lucius which means “as of light”. Lucy has a tattoo of a crescent moon on her left side. 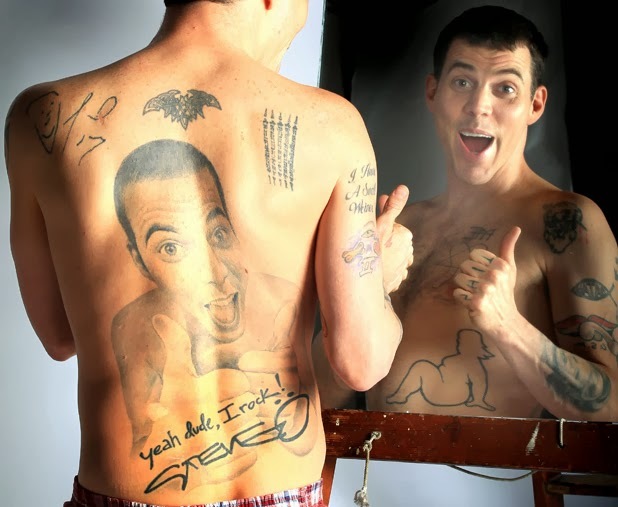 There is no particular meaning or reason for the tattoo, she decided to have it because she liked it the way it appeared. Lucy Hale has “Courage, Dear Heart” inked just below her left breast which is a line from C.S. Lewis’s book “The Voyage Of The Dawn Treader” from Chronicles of Narnia series. Hale has a tattoo that reads, “LOVE HER BUT LEAVE HER WILD” which is a quote from a poet Atticus. Amidst All the tattoos Lucy Hale has, The most meaningful tattoo and also the most emotional one is the one on her arm which reads, ” I love you” in cursives. What makes it most meaningful is the fact that it has been written in her Late Grandmother’s writing which tells a lot about the bond she had with her Grandmother. 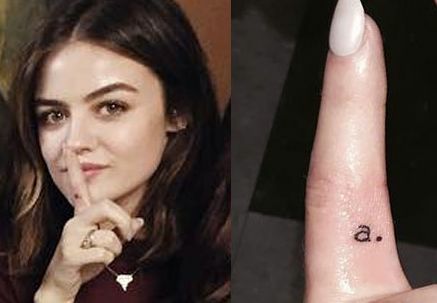 The Pretty Little Liar star has her Character’s initial ‘a’ inked on her index finger of the right hand. She did so along with all her co-stars. 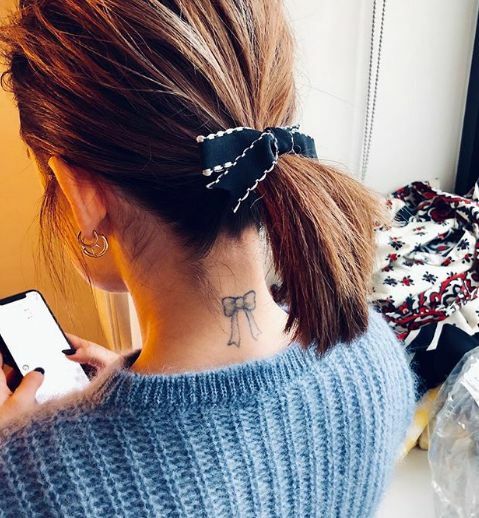 Lucy Hale has a huge love for writings which is visible in her tattoos as she has another writing, “Catch the foxes for us”inked on the right side of her ribcage. This line is taken from the Bible. 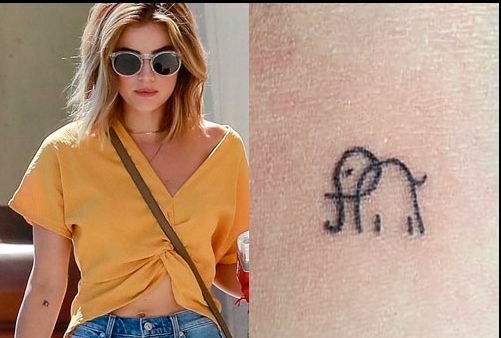 On her visit to Cambodia, lucy hale couldn’t find any Elephant but she got an elephant inked on her right forearm at BAYON tattoo which is named after BAYON temple in Angkor Wat. Lucy has a tattoo of Evil Eye inked by Dr Woo on her right ankle which she believes is for warding off the evil spirits.